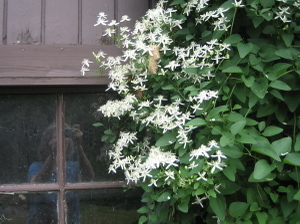 Sweet Autumn Clematis is so easy to rejuvenate. Cut back those old thick woody stems to the ground and you will see many new young blooming stems appear. Trust me on this. Since it blooms on new wood you will have blooms the same season you cut just less the first year until it bulks up again.The massive root system will throw up many stems right away. I cut some out most years to keep it from becoming a huge mass. On BHG's Garden Talk forum one of the woman there with an exceptional garden cut her's back to the ground and only allows it to grow up to fill her trellis. More work than I would like to do keeping it tamed but it shows how hardy these vines can be. I was expecting that to happen, but so far nothing.